I’m ready to eat. Ready for turkey. Ready to cook two kinds of bread for homemade stuffing from scratch on Thursday. (What was I thinking with the homemade stuffing???) One thing I’m not really ready for is all the other dinners this week. I’m feeling a little overwhelmed. 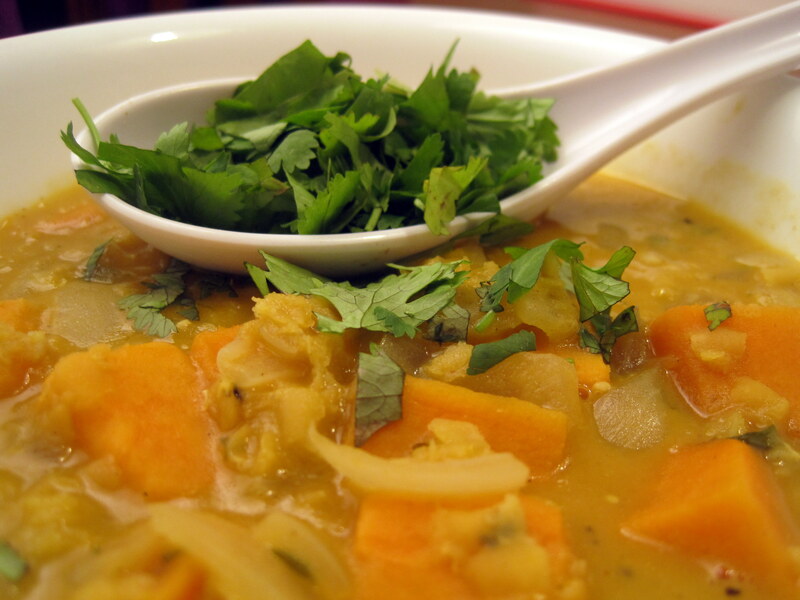 Enter red lentil soup. This recipe is healthy, tasty, and it only takes about 10 minutes of hands-on work to prepare. It’s also inexpensive and easily adaptable to whatever fall produce you have on hand: sweet potatoes, leeks, onions, winter squash, whatever. Best part is, while it’s bubbling away on the stove, there’s plenty of time to whip up some stuffing. Chop onion and garlic. Saute them in oil in a heavy bottomed pot over medium heat. Meanwhile, peel and chop sweet potato or squash. Once onion is translucent, add all remaining ingredients except for half the cilantro and all the lime wedges. Bring soup to a boil, reduce heat to medium low and simmer for half an hour, until potatoes/squash and lentils are tender. Taste soup and season with salt and pepper. 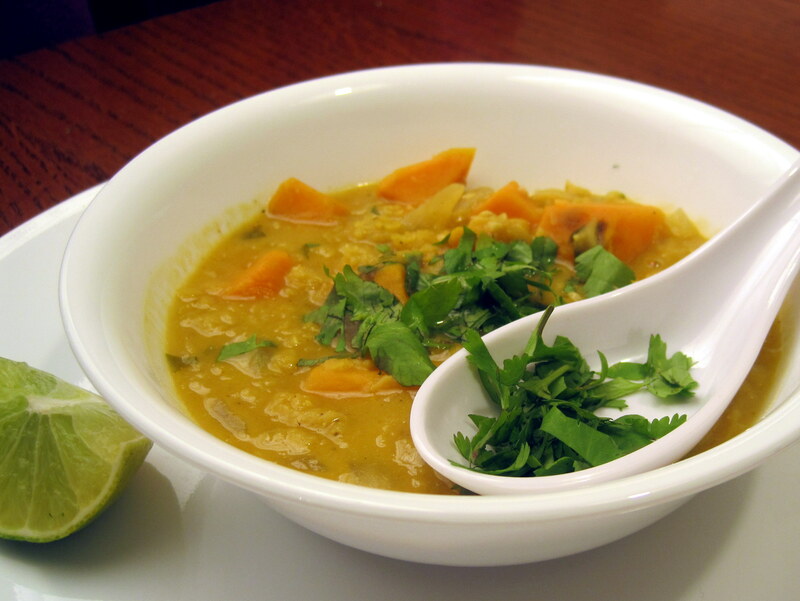 Garnish each bowl of finished soup with fresh cilantro and a lime wedge. 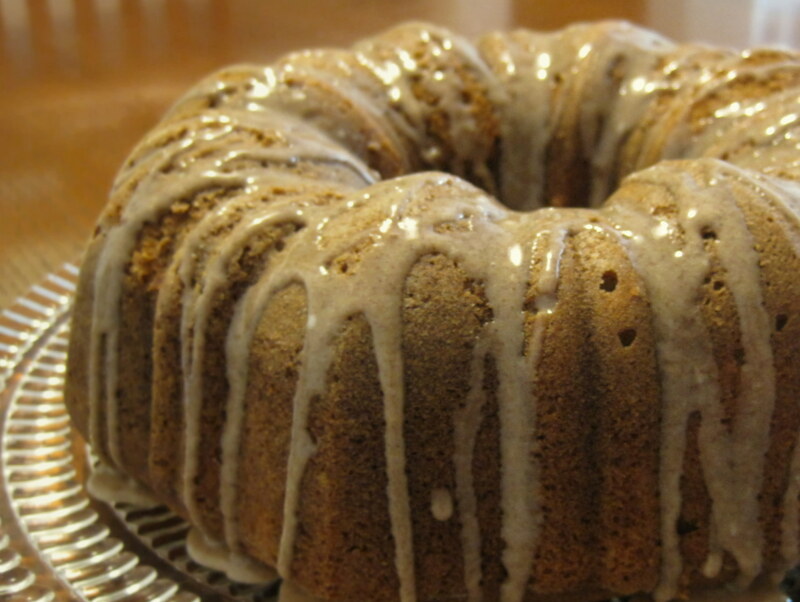 I made this pumpkin pound cake with cinnamon glaze for a friend’s baby shower at work this week. There are several interesting pumpkin cake recipes floating around on the internet; I adapted this one from a pound cake recipe by Kay Prosonic on allrecipes.com, omitting the pecans from her recipe and using fresh pumpkin in place of canned. I opted for a cinnamon glaze instead of a rum flavor since I was cooking for a baby shower. Bundt cakes are one of my favorite desserts for a potluck because they’re easy to make ahead, they travel well and they feed a lot of people. I also like how easy they are to decorate. Baking with a bundt pan is not difficult, but it can be a little intimidating if you’re not familiar with the proper technique for greasing the pan and removing the finished cake. The best instructional resource I have found is this series of videos by a bakeware company on YouTube. Preheat oven to 350 degrees; grease and flour a 10-inch bundt pan. An electric mixer is helpful, but not mandatory for this recipe. Mix shortening and sugars in a large bowl until creamy. Add eggs one at a time, beating well after each addition. Add pumpkin and mix until fully combined. In a separate bowl, combine flour, cinnamon, baking powder, baking soda, salt, nutmeg, allspice and ginger. Add to the creamed mixture and mix until just combined. Pour into prepared bundt pan and bake for 60-65 minutes until a wooden skewer or cake tester inserted near the center comes out clean. Cool in pan for 10 minutes. 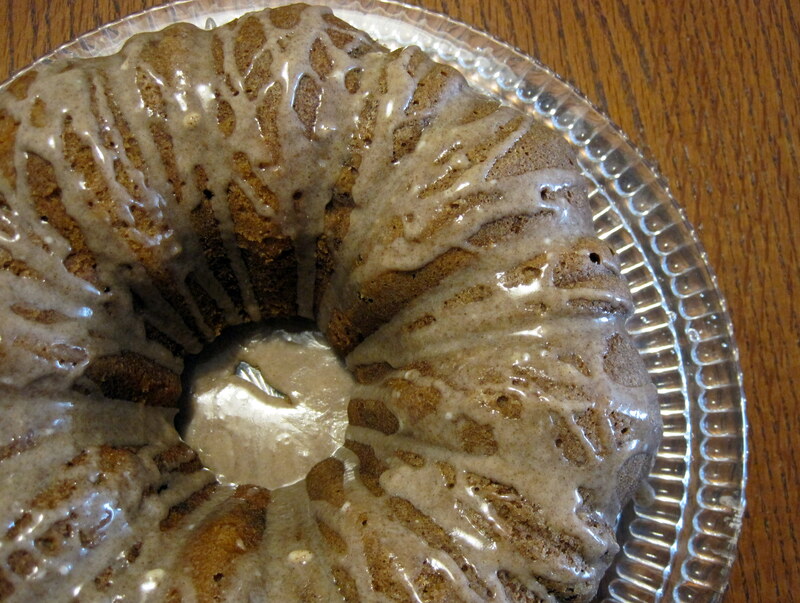 Remove cake from pan by placing a wire rack on top of the bundt pan and inverting the cake onto the rack. For glaze, sift the powdered sugar and cinnamon into a small bowl. Stir in milk until combined. Drizzle over cooled cake. My favorite method for drizzling is to pour the glaze into a ziploc bag, snip off a bottom corner, and use the ziploc like a piping bag to drizzle the glaze all over the cake. The insides of pumpkins are, in general, kind of gross. They’re slimy and seedy and sticky and sweaty. And orange. 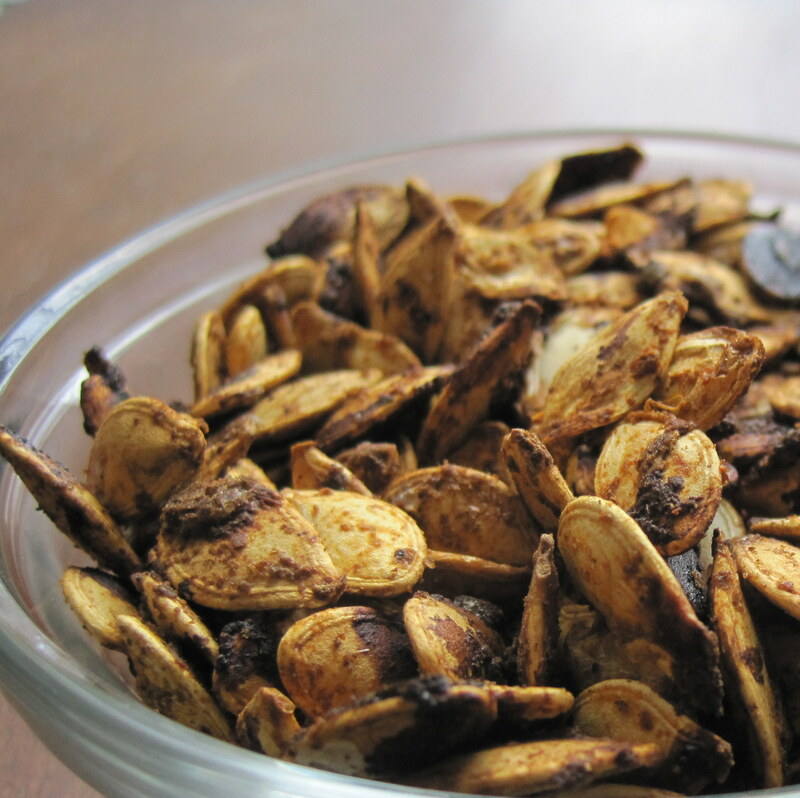 But if you persevere through the guts and roast the seeds with spices, salt and lime juice, you’ll get a delicious and healthy snack: Chili Lime Pumpkin Seeds. These little guys are really spicy and addicting! They’d be perfect at a cocktail party or a tailgate, or even in a big green salad instead of croutons. We enjoyed ours with some cold Real Ale during movie night. Preheat oven to 350 degrees. Grease a cookie sheet with olive oil. 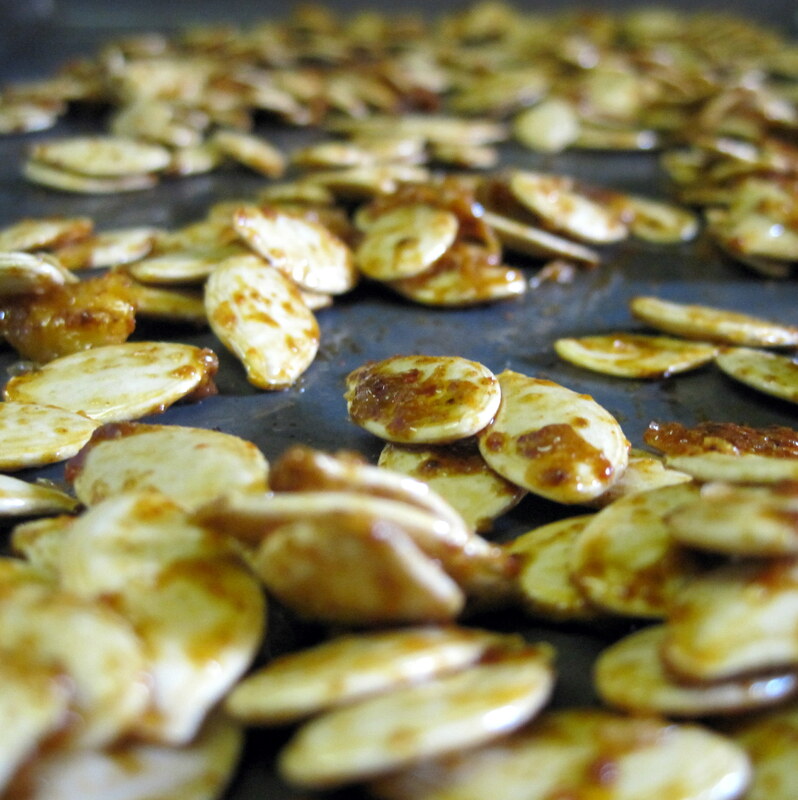 In a bowl, mix pumpkin seeds with 1 teaspoon olive oil and spices until the seeds are evenly coated. Use a wooden spoon to spread seeds into a single layer on cookie sheet and bake for 25-30 minutes, stirring frequently, until seeds are crispy and dry. Remove from oven and squeeze 1/2 a lime over the top of the seeds. Stir with a wooden spoon to distribute lime juice evenly and loosen any seeds that are stuck to the cookie sheet. Allow to cool before eating (if you can resist them). Now that the weather is cooling off I’m finally excited about fall. I wore some boots and a sweater today, and I am really excited to tackle a few pumpkin recipes I’ve been eyeing. The only bummer is that I can’t find any locally sourced, organic pumpkin here in central Texas. The closest grower I could find is Krause Farm near Navasota, Texas, about two and half hours east of Austin. That’s stretching the bounds of “local” for me, so I’ll probably be picking up a few organic pie pumpkins at Central Market this afternoon. I’m planning to try to make version of this Pumpkin Infused Vodka and my own recipe for Pumpkin Bagels in the next few days. Wish me luck slogging through all those snotty pumpkin insides! Out of fairness, I should mention that there are a few local non-organic pumpkin patches close to Austin that might be fun to visit. Evergreen Farms is the closest pumpkin patch to Austin. Located in Elgin, Texas, Evergreen sells non-organic jack o’lantern pumpkins, plus they offer pumpkin decorating, a petting zoo, and the intriguing sounding “Pumpkin Launcher” for just $2. They also have a cut-your-own Christmas tree lot starting the Friday after Thanksgiving.